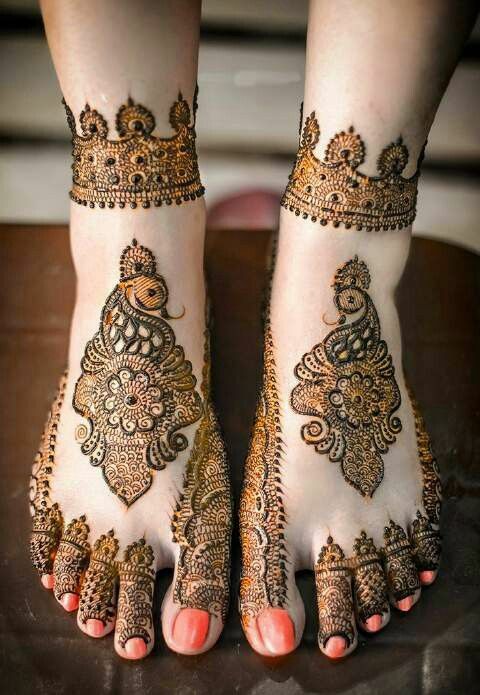 With the wedding season comes the time to decorate our hands and feet with beautiful mehendi. Whether it me intricately full, modestly beautiful or absolutely minimalist, everyone wants to decorate their hands and legs. A recent trend is not to go elaborate but keep it magnificent in a simple flowy design. Made diagonally across the foot this mehendi design has a flower in the middle of the design from which it tapers out to the corners. One corner starts from the big toe, just before the nail and the other travels upwards, ending a little bit above the foot. The other toes are designed with a simple pattern of leaves on a twig. 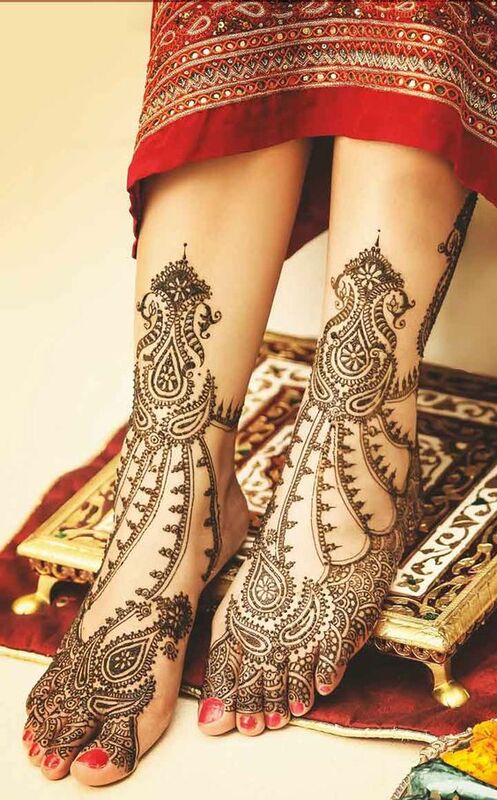 Covering the length of your foot to the knee, this mehendi design is minutely detailed throughout. Some basic shapes are used to cover the length and then intricate, miniscule designs are used to fill up the bigger basic shapes. To add the bold end to the flow of the design, a bold border is made near the knee which is then followed by a shape with a picture in the middle of it. For example, an elephant at the knee. Designed in a pattern similar to the red ink painted around a dancer’s foot, this mehendi design is for the minimalist who does not want to go to elaborate lengths. The front portion of the foot is intricately designed in a linear pattern forming a wide v. A small design is made just above the V, on the centre of the foot. The back of the foot is covered in floral designs, giving it the effect of finishing under the foot. Imagine a canopy of lights above the street during any festival. Simple yet Beautiful. This design is a deceivingly simple design. Starting from where your toenails end, this mehendi design is intricately made on the front of your foot, while a keeping a three-petal design as a centre of the design. It is connected to the larger structure on your leg with linear patterns that are asymmetrical in length. They come down in curves to join both the designs and form continuity. This design combines two types of netted patterns. There is a simple netted, criss-cross design on the toes. Starting from the end of the toes, the criss-cross pattern staying the same, the lines are more detailed and intricate with smaller symmetrical designs in the intersections. It ends on a larger pattern above the foot. 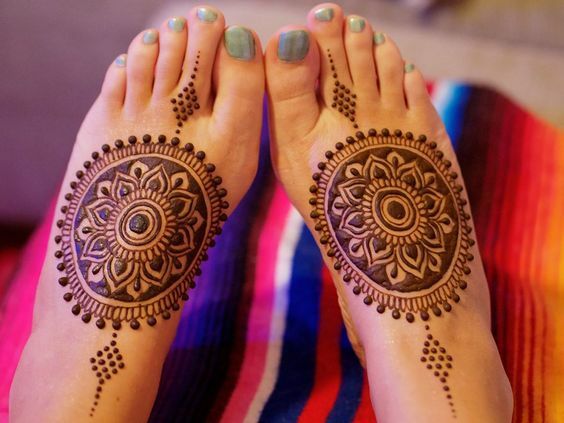 This mehendi design comprises of a circle made on the centre of one’s foot. The circle is made in three parts. The innermost layer contains a flower with a few concentric circles and closely packed petals. The outer ring is made in a simple striated pattern and the outermost layer is a broken circle of dots. To give the design more character, small diamond shapes are made with dots on two sides of the circle, looking dainty and beautiful. For this mehendi design, a peacock is made in a unique shape with an intricately made design for the base. The design on the rest of the foot is made to look like a frame for the peacock. The frame reminds one of what they would see on a border of a saree. The border is made across the toes, the sides of the foot and just on top of the foot, it made in the shape of a ring, rather a crown. Picture a simple sequin dupatta for a heavy salwar suit or a lehenga. This mehendi design looks exactly like that. 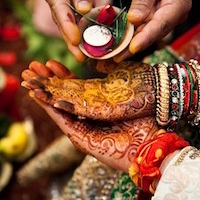 The entire foot is covered in tiny designs like the sequins on the dupatta and on the leg, to mark a border, the mehendi is made in the form of a payal. The ornament is simple, with a locket hanging on one side and a broad chain. Made like a delicate and beautiful creeper travelling the length of one’s foot, this design is made with an abundance of flowers. 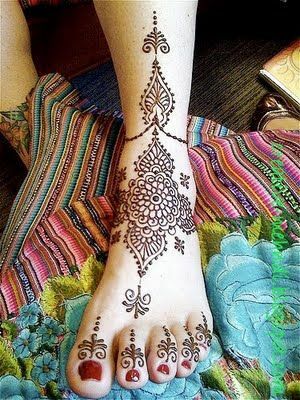 The toes are covered in simple three leaf design and the foot is covered with two big and simple flower designs. Covering the space between the two flowers, smaller design is made in two bigger arches. 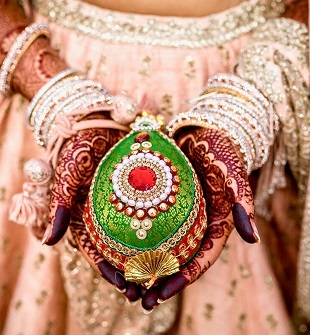 This mehendi design made beautifully and sparsely has no design filled in. Like a simple chain with a heavy locket, the main design hangs from a simple linear design around the ankle. It is made in the shape of a flower with a uniform design protruding from four sides. The toes are covered in a simple flower bud design. 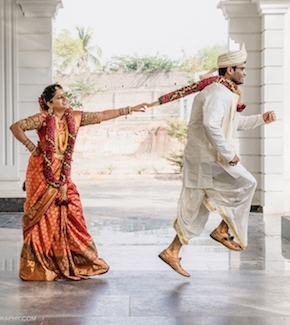 So these were some of the most beautiful mehendi designs for legs for your wedding function. Tell us your favourite one in the comments section.